Ancient earthquakes have left their mark. We also did a ride to Sella for lunch and then came back up over the Pueto Tudons having spent the 12km going downhill thinking I'll never get back up this! Cycling Weekly's Health & Fitness magazine based themselves at number 19 for a week to shoot the upcoming spring issue. Tom was fantastic with the organisation, accommodating our last minute change of plans and extending our stay. The villa was spacious, with plenty of amenities and space for all our kit, bikes and photographic equipment. The cycling in the surrounding region offered spectacular terrain and views, making capturing the perfect shoots a pleasure. Every time the models pushed out the door there was another hairpin to whiz down or a mountain to challenge on. Great spot and we'll definately stay again... Got some good routes in. Sella as always immaculate bolted routes, but most memorable probably trad routes on Toix Sea Cliffs (Mystery tour) and Cordoba multi pitch routes. Next visit more trad big routes and mountain biking. Hi there, and thank you for a fantastic stay. Your house, it's location, the weather, the climbing and our friendly host Dan were all excellent. Hope to do it all again soon, maybe then with some of my more extreme friends as I see the possibilities are endless for all sorts of adrenaline fixes. We stayed for a week in Abdet and spent a day climbing here but could easily have climbed for several more. Fantastic rock quality, lovely well bolted single pitch routes and an amazing setting. Well worth a visit. 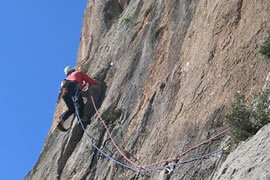 The climbing was superb – on pristine rock with solid shiny new bolts – all to ourselves. Too much to do and not enough time to do it. We ventured up to the Serrella Slab on a bakingly hot day. What a place, what a route – only managed to top-rope it though. (photo below) A bit too intimidating to try a lead!. The trip was awesome. We climbed everyday, just had a break during the middle of the day as the temperature was a little to much (July). Thanks very much for the appartment. the place was amazing. Everyone was blown away at how nice the place was. We ended up climbing mainly locally. The routes at Guadalest were really cool and fresh. There was still friction on the limestone. Where as Sella alot of the routes were really polished. 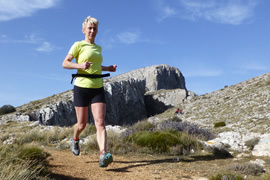 Amazing opportunities exist for trail and mountain running amidst the spectacular Costa Blanca Mountains. 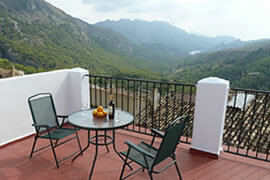 Guided holidays (full weeks and long weekends) are available. It is possible to train all year around, in warmer weather we set of before dawn in the clear mountain air and run through the sunrise until things start to get hot around midday! Then we relax the rest of the day in a local canyon or pool. In Spring Autumn and winter the climate is ideal for longer runs, great if you are training for ultramarathons. Our running routes include a visit to Valencias highest summit, a trail through amazing rock pinnacles, rock crevasses and ancient castles. 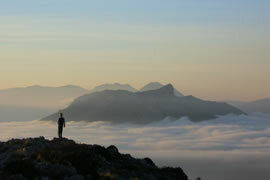 You will be guided by an experienced ultra runner who will unlock the secrets of this amazign venue for you. The rugged mountains of the Costa Blanca offer a wonderful landscape of pinnacled ridges, enourmous crags and shady pines. Orange and almond groved enhance the valleys, whilst attractive mountain villages provide hospitality, offering a real Spanish experience. There is plenty to do in summer in Abdet. The location of the village high in the mountains means you get beautiful fresh air and a pleasant breeze. The houses stay cool with their thick walls. The Lake at Guadalest is good for swimming although it is not encouraged you are allowed to do so, Access from the dam (plenty of parking) and walk about 200 metres along the track leading from the dam. There is also a nice stream above the Lake. about 1km toward Abdet on the small rural road. The water is very cold but always flows as it is pumped out from under the mountains! 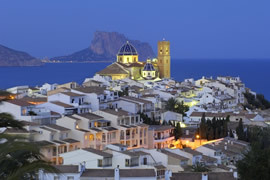 There are still weeks available in the summer - ideal for family holidays in the Costa Blanca, contact us for special deals! Book online and save more! ESTA Heading for vacation and looking to buy timeshare for your next vacation accommodation? A Marriott timeshare or a WorldMark timeshare offer the prefect accommodation options when looking for affordable lodging just about any where in the world. Teach English Online. www.usctauthetapi.com- where expert writers share their knowledge.